The Real Media Library does not say it’s version anywhere in it’s description text so it’s hard for me to tell if it’s up to date, but I don’t see why it wouldn’t be. Please advise on how I should trouble shoot this. Okay, So I uninstalled Real Media Library, and reinstalled it, added the license key and it updated fine. But when I do a test on my local server, I don’t see the files that have been previously uploaded actually changing directory location. I know that you’ve put this on some kind of queue but how do I actually know when that queue goes? how long does it take? Does my browser window have to be open in the media page or what? It does appear to work fine on my remote production server though. Any ideas on why that is? My local server is run through Laragon, on Windows. My production server is an Ubuntu VPS server. I’m going to try deactivated and reactivating everything from scratch and see if that helps? Welp, that didn’t work. I also notice that my local site isn’t using SSL anymore which is weird since I have that set in laragon as a requirement and it shows itself as loading through SSL. Anyway if you have any other ideas of how we can fix this or need more info from me, let me know. It can’t be fixed by going in and trying to select the correct image either. And the way that the images are showing up in admin backend is extremely inconsistent. And whats your PHP Version? I will try to reprocedure this. It seems that something fails. I don’t know what. The issues on my local windows machine has to do with the structure of the folders created when items are moved. But the more pressing problem is on my production server. My production server is not serving the correct images, and I don’t see anyway to fix this. I provided documentation images in my previous comments, but if you want you can see the problems at https://jackalope.tech The “Lodestone Social” case study has an incorrect background. It seems that the name of the file it is referencing was 1.jpg and was found in the side-projects folder while the image it SHOULD be showing is 1.jpg which should have been found in the lodestone folder. What should I do? Do I reset my absolute paths etc? Is this issue unfixable and I’m going to have to completely wipe my database? You can also email me at aslan@jackalope.tech and I can give you login information. I trust you on this stuff having talked to you a bit and seeing your website and stuff, and I know diagnosing this issue might be hard without direct ssh access. 1. So 1.jpg was showing and was what was supposed to show, but 1.jpg was a different image than the one that you linked. The one that it was was the one named lodestone.jpg now. I renamed and reuploaded that image because I didn’t want someone coming to my professional website and seeing the incorrect image. You might no be seeing it on your frontend yet if my CloudFlare CDN hasn’t updated their servers in your region of the world yet which is probably why you were able to get the youtube video you did. 2. I didn’t try the manual move thing you linked a picture of before adding the automatic queuing because I didn’t know how to do that. I’m actually still not quite sure what the difference is between that and what I enabled, and I’m honestly not sure how or where in the UI to find that info. Overall, it seems that my website is back to normal as I have gone in and manually changed the 4 images that were giving me problems. The incorrect images are still in my database and media library, it’s just I’ve replaced them with reuploaded images. There might be a couple of more images that were messed up in my blog posts or side project folders but so far it does not appear so. Mostly I think the issue is related to the case study stuff because they’re 1) using the classic editor still, while everything else is gutenberg and 2) the case studies are older articles from previous versions of the website I made as static handcoded html websites, so I was lazy and named all the images 1.jpg, 2.jpg, 3.jpg etc, and so the confusion for RPM Folders is probably due to similarities in naming getting wonky as I bulk moved large numbers of images around to different folders. This is overall a good result compared to other similar plugins I’ve tried in the past, but it does make me a little nervous as to if this thing is going to explode and mess up at some point in the future, and I’d be a little more confident if I knew why this problem had happened in the first place. I also rearranged some additional images that were still in the root of my website folder and stuff using ssh cli, and found that the results on the admin side of thing were flawless. None of those images seemed to have gone amiss anywhere on the website. Conclusion: while I would be interested in having the cause of this bug etc figured out a bit more, just to know that this issue won’t happen again, and to know that this product is being well maintained, I am also largely satisfied with the performance of the product so far. I also think some elements of the documentation or UX could be streamlined a little. At least for me i found some parts a little confusing. If you would like me to provide more information so that you can debug, please let me know and I will try to help as much as I can. I’m going to hold off on a review for a monthish just to give the plugin more time to perform but so far things seem okay now. The plugin WP Real Physical Media (Add-On) could not be initialized because Real Media Library is not active (maybe not installed neither) or the version of Real Media Library is < 4.0.10 (please update). ?? ? ?? Replied to your refund request. Is there any way to have Real Media Library and Physical Media Library Folders sync up to the already existing folder structure under uploads? How we would go about to do that? Can you add overwrite feature to this items? When I need to change bulk image because wrong size so I need to replace them. I’ve just bought your plugin and I don’t understand how to activate it. There are no fields for activation code. The problem is I have one button there “License Settings” which is next to Deactivate button. If I press “License Settings”, I can see “What’s this?” link, “Check for updates” and “Deactivate” buttons. Below there is “You license key:” and no more fields to input data. Dont mind about the file paths, “modules” is the WP_PLUGIN_DIR and wp itself is installed to “cms” subfolder. What can I do? That happens for the initialization of the existing media after installation, in the queue in the admin bar. Boths plugins are the latest version. Btw.. why is that additional plugin needed at all? Sorry for bombing you here, but is that additional plugin needed to have RealPhysicalMedia working at all? Hallo! Welche Version von Media File Renamer verwendest Du? Der manuelle include ist generell nicht notwendig. Auf welchem System / Hosting benutzt Du das Plugin? Real Physical Media dient als Warteschlangen- und SEO-System für zu verschiebende Dateien anhand des Real Media Library Baums. Da andere Plugins wie Media File Renamer den Job von Dateiumbennung schon gut beherrschen, wurde dieser als Rename-Handler verwendet. Es ist ein ganz normales Linux Hosting mit Composer. Irgendwie scheint “Media File Renamer” aber nicht richtig geladen worden zu sein. Ich möchte das zusätzliche Plugin eigentlich gar nicht nutzen. Braucht man es, damit Dateien entsprechend verschoben werden? Umbenennen muss nicht sein. Ja also irgendwie ist das nicht so ganz das, was ich gesucht hatte leider Warum machst du nicht ein RML plugin in der “Ultimate” version, welches RML um eine komplette 2-Wege-Synchronisation mit dem Dateisystem erweitert? Da würde ich auch gerne das X-fache für zahlen. Wo/Wie kann ich denn einen eigenen Handler definieren? The end purpose is to make the database be quicker, and also the search for that picture to be quicker on the FTP – instead of searchis through 30000+ in one folder, just search in ~ 300 pictures in one subfolder (so it won’t need to much server processor ’’horsepower’‘). This is the second time I am contacting you guys I purchased 2 plugins from you and they are working extremely slow. I need some help fixing this issue before I deliver the project to the client. media files are not always loading and we are having speed issues on the plugin. Please get back to us as soon as possible because we are stuck on the project because of your plugin. Hello, I have one issue using it. I do use Pro version of Media File Renamer plugin. It provides Numbered Files feature by putting a number at the end of filename if filename is identical. However, it seems not working when the file with the same name moved to the same destination folder. Eventually, the file is overwritten. And only one file remains and two media post type with the same filename remain in the media library. Can you check and see what is going on? Thank you. Hi there, for uploading 1000s of files in bulk you’ve implemented cool queue feature, so they are uploading fine. BUT when I try and delete 1000s of images the server stops responding. Do you have same queue solution for deleting 1000s of files in this addon? Hi Matthias, ich hab deine beiden Plugins gekauft, Real Media Library und das Physical Addon. Super Sache und klappt soweit auch sehr gut alles, nur hab ich mit PDF Dateien einige Probleme. Sie wollen sich einfach nicht auf die neuen Ordner synchen (Sehe immer die Meldung: “The physical file is not synchronized with the above folder. 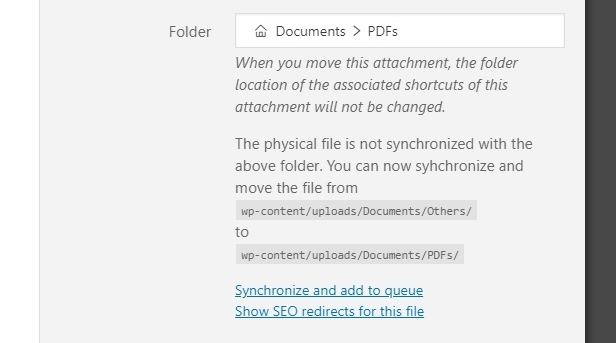 You can now syhchronize and move the file from wp-content/uploads/ to wp-content/uploads/pdf/”). Es tut sich aber nichts, wenn ich synchronisiere. Auch verlieren die PDFs ihre Thumbnails, wenn man sie von Ordner zu Ordner verschiebt. Ist das Problem dir bekannt? Zusätzlich gibt es noch WPML 4.1.1 mit der Option “Different domain per language” und “Translate existing media in all languages”. Zuvor war “Media Library Folders for WordPress” von Max Foundry im Einsatz, welches jetzt von deinen Plugins abgelöst werden soll. Damit wurden schon Ordner angelegt, die aber nicht gut mit WPML zurecht kamen; Die “Reinitialize” Funktion von RPM hat dann alle Dateien aus diesen Ordnern wieder in den /uploads Ordner zusammengeworfen. Dies betraf nur einen Teil der PDFs. Manche waren im /pdf Ordner, manche waren normal in den Monatsordnern (das war auch die Standardeinstellung), jetzt liegen alle zusammen unter /uploads. Was mir bei den PDFs grad aufgefallen ist: die Attachment-URL zeigt immer noch auf den uploads/2018/09/ Ordner, und ein manuelles Umbenennen mit Media File Renamer ist ebenfalls nicht möglich. Die Logs sind aber leer. Es scheint also aktuell nichts mit deinem Plugin zutun zu haben, sondern eine Ebene tiefer zu liegen. Ich werde weiter ermitteln, woran es liegen könnte und mich dann ggf noch mal melden. Leider nein. Habe die letzten zwei Tage vier Wordpress-Installationen auf dem Staging-System zerschossen und wiederhergestellt. Es läuft darauf hinaus, dass ein umbenennen der pdfs nicht möglich ist. Unabhängig davon, ob diese unter uploads/pdf/ lagen (damals verschoben mittels “Media Library Folders for WordPress”) oder regulär in den Monats-Ordnern. Ich versuche weiterhin Dinge, hauptsächlich verschiedene Reihenfolgen von Thumbnails löschen, Media Library Folders for WordPress deaktivieren und resetten, Add from Server versuchen, manuell auf dem Server verschieben, etc. Ggf schreib ich Jordy auch mal an, vielleicht kann er mir weiterhelfen. Was mir noch aufgefallen ist, ich bekomme ab und zu die Meldung “Cookie nonce is invalid” im Queue-Dropdown in der TopNavi. Andere Plugins, die die API nutzen, funktionieren aber (z.B. Redirection). Ist dir die Meldung bekannt, hat das etwas mit deinem Plugin zutun? Set and activated Physical. In addition installed a plug-in from the list. I click Activate automatic queueing, gives an error message – You haven’t activated a handler. What’s the problem? Won’t replace that needs to be clicked: Activate as handler When the file for a possibility of the translation is added? Yeah, I have added this to my backlog to create translations correctly. Does the plugin now work for you? OK fein, danke. Werden damit die Bilder in den Jahresordnern welche Wordpress angelegt werden direkt verschoben oder muss ich diese Ordner manuell löschen ? 2.Frage: Werden bei zukünftigen Uploads die Bilder gleich in die Gewünschten ordner auf dem FTP Server gestellt ? oder kommen die erst in die Jahresordner ?